The government of Canada is in the form of a constitutional monarchy. The Queen or King is the country's Head of State, however, the Prime Minister is actually the Head of Government. Parliament creates and passes bills, and the Governor General, who is the representative of the Monarch, signs them into law. In addition to this, the country is a federal state, meaning its three territories and ten provinces share a central government. Canada's Parliament is made up of three parts that work together as the country's lawmaking body. The Monarch is represented by the Governor General, and is the Head of State. The Senate, which is the Upper Chamber of Parliament, is made up of 105 appointed members who represent the country's regions. The House of Commons, or Lower Chamber, consists of 338 elected members representing the population of Canada. The buildings of Parliament Hill existed before Canada was a country. In 1859, construction of the buildings began, as they were needed to house the Province of Canada's government. They became the home of the federal Parliament in 1867 when Canada became its own country. Parliament is made up of three buildings: Centre Block, East Block, and West Block. The Centre Block houses the House of Commons and the Senate, with the other two Blocks being home to the offices of parliamentarians. Guided tours for parts of Parliament Hill are available at certain times to the public. The Centre Block guided tours offer visitors an opportunity to discover the art, functions, and history of the Parliament of Canada. The iconic Centre Block buildings is the home of the Library of Parliament, House of Commons, and the Senate. Free tours are offered to the public on a daily basis, with tours lasting about twenty to fifty minutes. The time depends on the activities of Parliament that day. Visitors can get free tickets for the tour across the street from Parliament Hill at 90 Wellington Street. 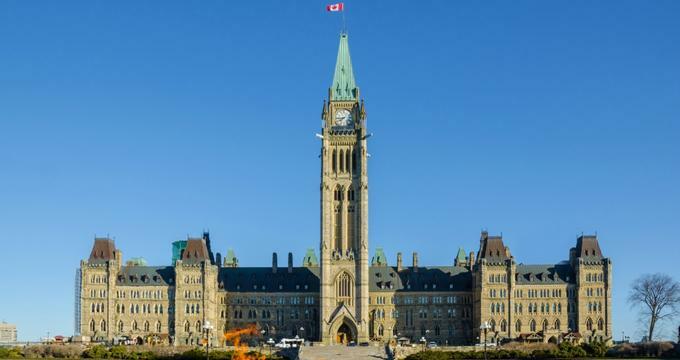 From the month of July until early September, visitors can tour the East Block of Parliament Hill, which was the government of Canada's nerve center throughout its first one hundred years. The guided tours of East Block take guests through restored heritage rooms to discover what life in Parliament was like during the late nineteenth century. These tours last around thirty to forty minutes, and feature the offices of the first prime minister of Canada, Sir John A. Macdonald; the Privy Council; Lord Dufferin, the Governor General; and Sir George-Étienne Cartier. Tour times for both the guided tours of Centre Block and East Block can be found on the website of Parliament Hill. Visitors wanting a more self-guided experience are able to tour part of Parliament Hill as well. Guests can experience amazing view of Canada's National Capital Region by climbing up the Peace Tower. The Memorial Chamber honors Canadians who gave their lives during military service. People visiting on these two structures are required to have a ticket, which can be acquired on a first-come, first-serve basis at 90 Wellington Street. Those participating in a guided tour of Parliament have admission to the Memorial Chamber and the Peace Tower included in their tour ticket.